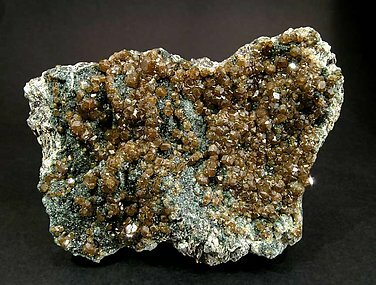 Very aerial aggregate, on matrix, of good sized crystals, very rich in faces, with the dominant forms of the dodecahedron and trapezohedron. The crystals have a greenish brown color and an extraordinary luster. A novelty at Tucson 2010. 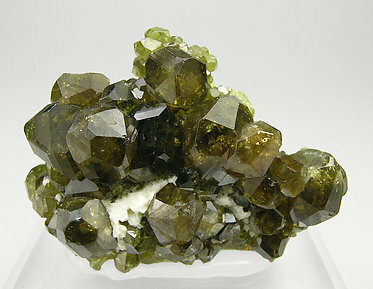 A centered group of good-sized crystals, very rich in faces, with the dominant forms of the dodecahedron and the trapezohedron and greenish brown color. 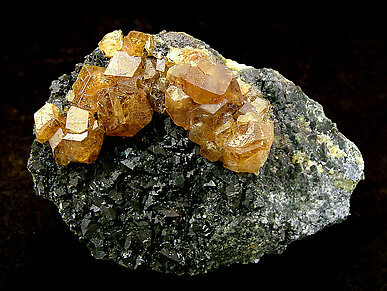 Their luster is extraordinary and they are with small white crystals of Stilbite. The Topazolite variety has been well defined on this kind of sample and this will be reflected in a future article in Mineralogical Record. A novelty at Tucson 2010. 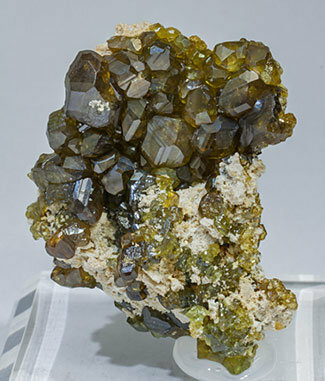 An alignment of good sized crystals, very rich of faces, with the dominant forms of the dodecahedron and the trapezohedron and greenish brown color. Their luster is extraordinary and they are with small white crystals of Stilbite. The Topazolite variety has been well defined on this kind of samples and this will be reflected in a future article in The Mineralogical Record. 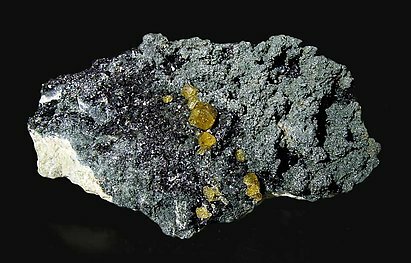 This variety of Andradite is from from the plentiful (and the only one known to date) find in the Yellow Cat Mine, November, 1998. Crystals are dodecahedra of very well-defined faces and edges; they are bright and have good color contrasting on a slightly bluish matrix partially covered by Clinochlore. 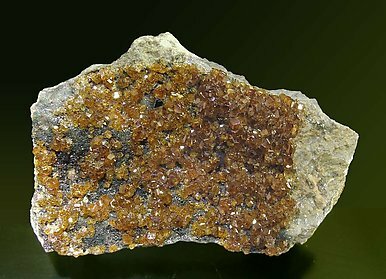 This variety of Andradite is from the plentiful (and the only one known to date) find in the Yellow Cat Mine, November, 1998. Crystallization is excellent, dodecahedrons have very well-defined faces and edges, and they are bright and have good color contrasting with a dark green matrix of Clinochlore. 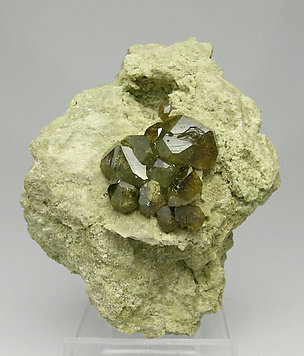 This variety of Andradite is from the plentiful (and the only one known to date) find in the Yellow Cat Mine, November, 1998. Crystals are dodecahedra of very well-defined faces and edges; they are bright and have good color contrasting on a slightly bluish matrix. 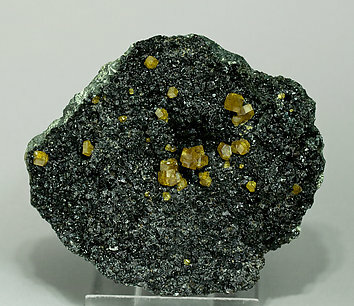 This one comes from a great one-time find made in November 1998 at the Yellow Cat Mine, the classic locality for this rare variety of Andradite. 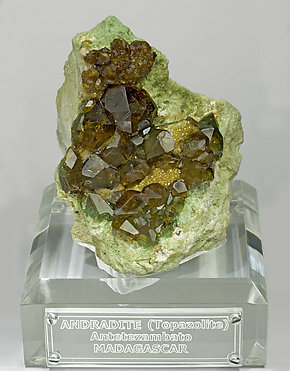 One can see the good growth forms of the rhombohedra in the crystals. The color, degree of transparency, and esthetic position on the matrix are also notable. The crystals, on matrix, are formed by the dodecahedron and the trapezohedron. 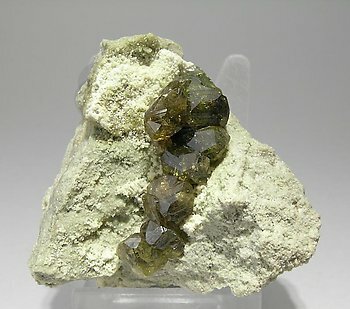 They have the greenish yellow color and the intense luster typical of this variety of Andradite from San Benito County. 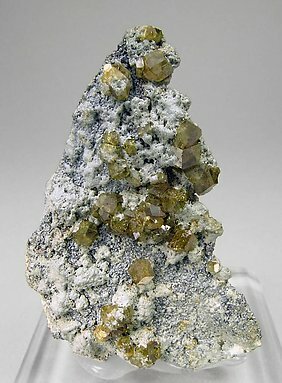 This variety of Andradite is from the plentiful (and the only one known to date) find in the Yellow Cat Mine, November, 1998. It has a surface rich with dodecahedra with very well-defined faces and edges, bright and having an excellent color. 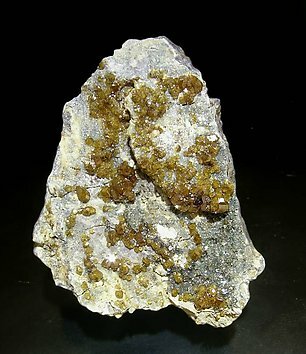 An excellent specimen of this Andradite variety from the plentiful (and the only one known to the date) find in the Yellow Cat Mine, November, 1998. The surface is fully covered by dodecahedral crystals with an excellent color and luster. Grouped and isolated crystals with very well defined faces and edges, translucent, very bright, with a very intense and uniform color and implanted on a matrix of Clinochlore. One of the best examples of the 1998 find. 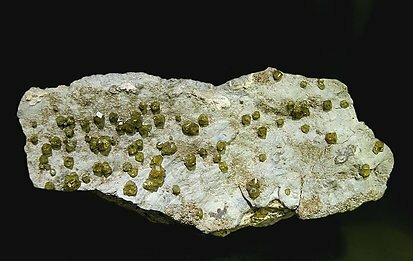 Group of big (for Topazolite) trapezohedral crystals that have grown on a first phase of Demantoid whose color, intense green, abruptly passes to the golden brown of Topazolite. The crystals are bright, transparent and have excellent, very deep color, being on a matrix of Quartz. A very exclusive sample. A novelty at Tucson 2010. 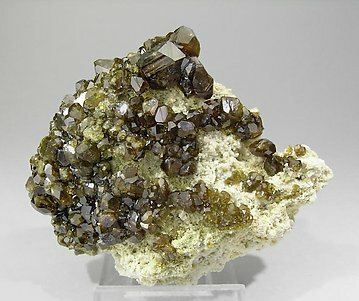 A druse on matrix of crystals very rich of faces, with the dominant forms of the dodecahedron and the trapezohedron and greenish brown color. Their luster is extraordinary and they are with small white crystals of Stilbite. The Topazolite variety has been well defined on this kind of sample and this will be reflected in a future article in Mineralogical Record. A novelty at Tucson 2010. Druse on matrix of crystals very rich of faces, with the dominant forms of the dodecahedron and the trapezohedron and brown color, slightly greenish. Their luster is extraordinary and they are with small white concretions of Stilbite. The Topazolite variety has been well defined on this kind of samples and this will be reflected in a future article in The Mineralogical Record.